• What are Glider Gloves? • How do they work on my touch device? • Will I be able to text and type with these gloves on? • Do they work on all touch screen devices? • Will they damage or scratch my screen? • What makes them better than the rest? • What are they made from? • Are the gloves made from any animal products? • How do I care for my gloves? • What is the difference between Urban and Winter style? • What sizes are available? • Are the gloves unisex? • How do they fit and feel? • Are they available in other colours? • Is there grip on the gloves? • Any other cool things I should know? • What are your shipping options? • What is your refund/exchange policy? • Do you have any specials or promotions? • Do you offer bulk purchasing? • There is something wrong with my product. Glider Gloves are touchscreen compatible gloves, or conductive gloves, or sometime even called iPhone gloves. They are winter gloves for touch screen devices. They allow you to keep your gloves on while still maintaining the ability to use your touchscreen device with accuracy and precision on all fingers and your entire hand. You can read more about them here. How do they work on my touch device? The magic is in the material. 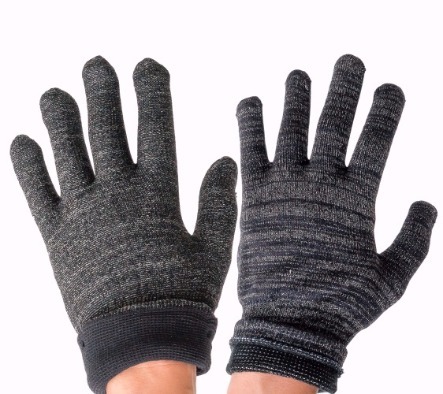 Glider Gloves makes use of conductive copper threads and fibers built into the glove’s yarn composition. These special yarns allow your body’s natural electric current to flow through the glove to your device, making it respond to your touch. Learn more about our conductive textile technology here. Will I be able to text and type with these gloves on? Yes, and almost as well as your bare hands. Since Glider Gloves are made entirely with conductive yarns, you get a much higher precision touch response – no matter your style of typing. You can use any part of your finger or hand with great accuracy for easy texting, twitting, and emails. Do they work on all touch screen devices? YES! Our touchscreen gloves work on ANY capacitive touch screen device. Some common examples include the iPhone, Galaxy, iPad, and more. Will they damage or scratch my screen? No way! Our gloves are soft and slick and will not damage or scratch your screen. What makes them better than the rest? Glider Gloves offer the consumer the best innovation in touch screen gloves. Its starts off with the gloves being made entirely from conductive materials – not just the finger tips like some of the other gloves. This means best-in-class accuracy and precision. Secondly, they are warm! Designed by Canadians, trust us when we say we know a thing or two about cold. Third, these gloves were designed by touchscreen device users for touchscreen device users. We’ve added cool features like anti-slip grip and a product tag that doubles as a screen cleaning cloth, just a few things that we know will come in handy. And to top things off, we offer Glider Gloves in a variety of limited edition colours and sizes to meet the tastes on any consumer. A lot of available gloves in the market are very thin and do not offer much protection from the elements. The cool factor of a touchscreen glove kind of wears off if your fingers are still frozen on the inside. But this is not the case with Glider Gloves. Our touchscreen gloves are made with layers, a conductive yarn mix on the outer a shell, a plaited and insulated middle layer, and a brushed acrylic layer that is soft on your hands. This traps the heat and circulates it. Mom always said to wear layers! Learn more about our layering technology here. Are the gloves made from any animal products? We are happy to report that our gloves are 100% vegan friendly and do not contain any animal products. To clean you Glider Gloves we recommend a gentle hand wash in cold water and to lay flat to dry. Use very mild soap or cleaning agents should your gloves get extremely dirty. Absolutely DO NOT TUMBLE DRY. When possible, keep your gloves in a dry place. If they get wet, take proactive steps to dry them out as soon as possible. This will help maintain the conductivity of the gloves. What is the difference between Urban and Winter style? The Urban style glove is a low profile fit and light weight and the Winter style glove is heavy duty and extra insulated. Shown in this picture are both Urban style (right) and Winter style (left) side by side for a visual comparison. We are happy to offer our gloves in size Small, Medium, Large, and Extra Large. While these sizes typically apply to our staple Black colour, other limited edition colours may not be available in the full size range. When you select your product, you will be advised what sizes are available for that particular style or colour. Yes. We have designed our touchscreen gloves to suit both men and women. How do they fit and feel? Our gloves are designed to be form fitting to your hand and contain 2% spandex. The Urban style tends to fit a bit looser, and the Winter style and Basic style fits a bit more snug. Take a look at our size chart for more details. Yes. Glider Gloves are available in Black as well as limited edition colours like Light Grey, Phlox, Honeysuckle, Deep Teal, and Olympian Blue. Each year we introduce new colours on a limited quantity basis. Act quickly to avoid missing out. Is there grip on the gloves? Yes – anti slip grip is available with the Urban and Winter styles. After our first year of business, our customers let us know that the Basic style glove was a bit slippery, and it was hard catch hold of their phone, steering wheel, door knobs, cup of coffee, and other such items. We listened and added grip. The anti-slip pattern is uniquely designed to prevent slippage yet it does not interfere with touching your device. The grip pattern runs along the entire palm and half way up the fingers. Any other cool things I should know? Sure there are! We all know how annoying finger prints and smudges can be on your screen. Did you know the product tag on the inside your Glider Gloves is made from the same micro-fiber material used to clean your screen? Did you also know that the since the entire glove is made from conductive yarns, it means that you can use any part of the glove to work your touch device. Maybe you don’t see the point yet, but think of us next time your hands are full and your able to use your knuckle to answer your phone. Glider Gloves will offer our customers 30 days from date of purchase to return or exchange their unused gloves (required proof of purchase and original packaging). For more details, visit our Refunds and Exchange page. We are able to accept Visa, MasterCard, AMEX, and PayPal. Your payment will be processed using PayPal’s secure hosted site. Every so often we have special sales and promotions publicly available to our customers. You can check our Special Offers page to see what’s currently available. Do you offer bulk purchasing? Yes we do. Bulk purchasing and discounted pricing will depend on your volume. Please visit our Wholesale page to see how to qualify. Alternatively, you can visit our Special Offers page for current promotions. Orders typically ship 1-2 days after you place an order. You will receive a shipment confirmation when your order has shipped and tracking information (if applicable) within 24-48 hours of shipment. Please refer to the shipping confirmation email that was sent to you. Kindly be advised that some shipping options do not provide tracking. This includes CanadaPost – Lettermail™, USPS - First-Class Mail ® (this service only provides delivery notification), and CanadaPost Small Packet ™ – International Air. Please email hello@glidergloves.com with your order # and details. There is something wrong with my product. If you feel that there is something wrong with your product, please contact customer service within 72 hours of receiving the product. Your product is protected by our Product Warranty program. To return your product, please follow the instructions provided in the Returns and Exchange section. 1) Click the " My Account / Order Status" link. Click the " My Account / Order Status" link to edit your account information. Click the " My Account / Order Status" link. Under the login box you'll see a link that says "Forgot your password? Click here". That link will send an email to you with your password. You will have to pay sales tax (HST/GST) if you are shipping your order to Canada.